Palestine is soon to have its day in court, after securing long-awaited membership at The Hague. Plagued by constant setbacks to a peace deal with Israel, the ICC newcomer wants to see Tel Aviv on the stand for alleged war crimes in Gaza. The April 1 accession to the International Criminal Court is the most substantial step to date in Palestine’s international legal campaign to seek justice for Israel’s operation ‘Protective Edge’ last summer, in which thousands of civilians were killed. Shortly before the summer assaults, Israel insisted that Hamas was firing rockets into its territory and answered with massive bombardment, complete with a ground phase that saw destruction on a scale not seen for decades. After 50 days, a ceasefire was agreed upon. ICC membership has been years in the making. It comes after Palestine gained UN observers status, followed by an increasing number of European countries recognizing them as an independent state or considering it. Israel’s operation tipped the balance in the Palestinians’ favor. It remains unclear how soon Palestine will be filing complaints against the Israelis, but an initial probe into war crimes by both sides is already in progress. The deadly July-August assault on Gaza has never been subject to a thorough, independent investigation, and the occupation of disputed territories and settlement-building by Israel is also ongoing. “The legal and technical committees have been extensively working on finalizing the two files” on Israel’s summer operation and its illegal settlement building, Saeb Erekat, the chief Palestinian negotiator in peace talks with Israel, told reporters. But will the opportunity at the ICC mean that Benjamin Netanyahu’s government will actually be tried, or will the case result in an added strain on the relationship between the two? In March, Palestinian leaders showed disapproval with Israel’s failure to comply with a number of bilateral agreements, and voted to suspend all forms of security coordination with Tel Aviv, a step that many fear will further escalate tensions. The ICC currently has more than 120 members, with Palestine the latest to join. Israel, however, is not a member of the Roman Statute of the ICC, fearing it would open the country up to manipulations and political pressure from other members. Joining the ICC opens up possibilities: the Palestinian leadership can not only take the Israelis to task for their summer campaign, they can also challenge the Jewish state’s continuing settlement building beyond the Green Line as a war crime. Israel’s settlement building has been condemned by the international community, including the UN. “The Palestinian authority must do something to try and protect its people against the ongoing occupation of both East Jerusalem and the West Bank, and the ongoing attacks on Gaza,” Fra Hughes, director of Palestine Aid, told RT. “The settlements themselves on the occupied Palestinian territories are a war crime under international legislation. No occupying force is allowed to move its civilian population into the disputed territories… A demand that the Palestinians knock down their own homes to make way for illegal settlement homes is definitely a war crime worth investigating,” Hughes points out. Israel considers any accusations leveled at it as an outrage and says it will not allow “Israeli Defense Forces (IDF) soldiers and officers be dragged to the International Criminal Court in The Hague.” The ICC has no authority to arrest suspects in Israel, but it could issue arrest warrants making it difficult for Israeli officials to travel abroad. Many in the EU and the world at large have spoken in favor of a two-state solution for Palestine and Israel. In February 2014, a number of European companies called for a boycott of Israeli goods – an “outrage” Netanyahu compared to Nazism. But admitting to the existence of a Palestinian state does little, when Netanyahu has made it clear that Hamas will never walk the streets of East Jerusalem while he’s in power. He did edit the assertion later, in an interview to MSNBC, shortly after achieving victory in the elections this March. "I don't want a one-state solution. I want a sustainable, peaceful, two-state solution, but for that, circumstances have to change," he said. Israel cut off millions of dollars in monthly tax it collects for the Palestinian Authority when it became clear Palestine would join the ICC. Palestine denied the rumors that it had agreed in exchange for not filing any complaints. “Taxes have nothing to do with our ICC approach. The ICC train already departed," Xavier Abu Eid, a spokesman for Palestine Liberation Organisation, said, according to AFP. The occupation of Palestinian territories continues. 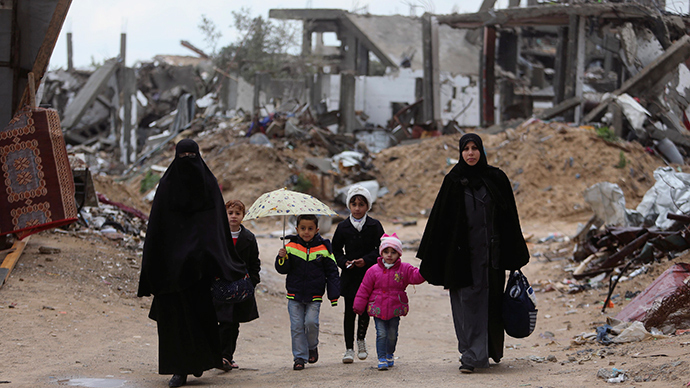 A fresh study by British NGO Action on Armed Violence has revealed disconcerting figures following the summer fighting – a 500-percent increase over the last nine years of the chances of getting hit by Israeli artillery in Gaza. The NGO's report reveals that rather than decreasing the risk of civilian deaths from Israeli explosive weapons, the IDF’s rules regulating such practices have been relaxed since 2005.